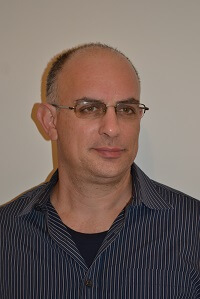 Dr. Oren Shriki completed undergraduate studies in physics and doctoral studies in computational neuroscience at the Hebrew University (Jerusalem, Israel). After a postdoctral period at the National Institute of Mental Health (Bethesda, MD, USA), he established the computational psychiatry lab at Ben-Gurion University. Research in his lab uses mathematical analyses of brain activity and machine learning techniques to develop novel diagnostic tools for neurological and psychiatric disorders. The lab also develops computational models of neuronal networks to gain insights into how changes in neural dynamics lead to brain disorders and how neural plasticity may assist in restoring healthy neural dynamics. Another line of research in the lab focuses on brain computer interfaces and neurofeedback. A major project in the lab involves developing a portable EEG system for real-time epileptic seizure prediction.